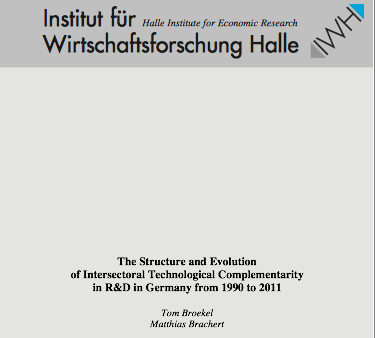 The working paper, title „The Structure and Evolution of Intersectoral Technological Complementarity in R&D in Germany from 1990 to 2011„, can be downloaded here. 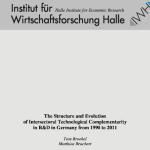 It is co-authored by Matthias Brachert (Halle Institute of Economic Research). Abstract: Technological complementarity is argued to be a crucial element for effective Research and Development (R&D) collaboration. The real structure is, however, still largely un- known. Based on the argument that organizations’ knowledge resources must fit for enabling collective learning and innovation, we use the co-occurrence of firms in collaborative R&D projects in Germany to assess inter-sectoral technological complementarity between 129 sectors. Based on the argument that organizations’ knowledge resources must fit for enabling collective learning and innovation, we use the co-occurrence of firms in collaborative R&D projects in Germany to assess inter-sectoral technological complementarity between 129 sectors. 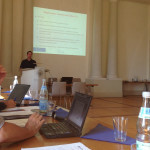 The results are mapped as complementarity space for the Germany economy. The space and its dynamics from 1990 to 2011 are analyzed by means of social network analysis. The results illustrate sectors being complements both from a dyadic and portfolio/ network perspective. This latter is important, as complementarities may only become fully effective when integrated in a complete set of different knowledge resources from multiple sectors. The dynamic perspective moreover reveals the shifting demand for knowledge resources among sectors at different time periods.